Every once in a while amidst the melange of mediocrity that lands at Progmeister towers, a pearl in a shell arrives. A jewel, hand crafted with great thought given to every nuance and minutiae, something judged from the outset to be something special. This happened recently when we took delivery of the debut album by Riversea. “Out Of An Ancient World” could very easily be mistaken as an album released much further on in a bands career. However, taking a look at the list of credits unearths a myriad of major talent garnered from well-established and respected musicians. The core of Riversea and founder members are Brendan Eyre (keyboards/programming) and wandering minstrel Marc Atkinson (vocals/guitar), two very talented individuals if ever I saw one. 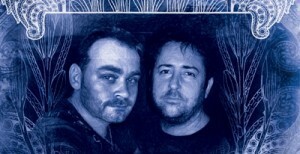 Marc’s beautiful song writing and Brendan’s amazing compositions is without doubt the key to the albums success. The atmosphere created on many of the songs is the result of allowing space, depth and breadth in the soundstage. This is not an album for lovers of their prog replete with keyboard and guitar excursions and twenty five minute operettas. Instead Riversea have created something rich in sophistication which will appeal to both traditional Prog fans and lovers of more traditional forms of rock. The album is beautifully packaged and utilises the artistic talent of the amazing Ed Unitsky who is without doubt the leading artist in modern Prog. The accompanying booklet contains not only accurate track by track credits; it also has clear and concise lyrics. Production is first class and the opening gambit “In The Beginning” sets the scene for what is a musical journey packed to the gunnels with emotion, excitement and finesse. Brendan Eyre’s powerful and rock steady keyboards drift into marc Atkinson’s lilting voice before thundering into a powerful, almost biblical statement aided and abated by Nine Stones Close axe man Adrian Jones. Indeed Riversea seem to have a guitarist for every occasion, “The Song” enlists the talents of Mark Rowen who lends a sweet yet treated inflection into this hope filled piece. Marc Atkinson’s voice has a svelte almost David Cassidy-like calm whilst never betraying his powerful prog roots. This has an added bonus of appealing to not only the Prog aficionado but their good ladies too. In fact I would site “Out Of An Ancient world as one of the most accessible of the genre and feel that it will appeal to many with few restrictions. “The Song” is brought to a crescendo by the amazing vocal talents of the beautiful Olivia Sparnenn who finishes things off rather nicely in a very Pink Floyd fashion. On a more serious note, “Is That What God Wants?” takes a look at the terrible ills in the world questioning belief and in some cases god’s lack of intervention. I found this song to be much preferable to Roger Waters song of a similar name and is probably one of the most powerful and thought provoking songs on the album. I find it amazing how Marc Atkinson’s voice trips from the sweet lilting balladeer to the all-out rock singer in the space of a few bars reminding me very much of Manfred Mann’s Chris Thompson. This really is an amazing piece of music which is a credit to the keyboard skills of Brendan Eyre and the writing talents of his band mate. Alex Cromarty’s drums are solid throughout the whole album though most notably here. To finish of such a tsunami of a song Adam Dawson nailed the concluding guitar solo to the wall. I found this song absolutely breathtaking. And they just keep coming; “Halo” is yet another song that forces the listener to reflect. From the beautiful tranquillity of the opening and closing piano through the massive orchestration to Bryan Josh’s wicked comfortably numb guitar lick this is yet another diamond in a crown of aural jewels. However, if it’s a bit og good honest prog with its associated drama then look no further than “The Fallen”. This really is a ball’s to the wall rejection of complacency with an injection of true grit. The Mellotron and grunge guitar are brutally beaten into submission by Alex Cromarty’s deft of hand with the drum sticks. Progtastic! It made me think that it was the kind of thing genesis should have done a bit more of with Ray Wilson, in fact this song could easily be mistaken for such a thing. Scale is something that Riversea seem to major on and a perfect example of this is “Eden”. A massive and apocalyptic message is delivered in a civilised way and yet again Marc’s finely penned words really prompt the listener into deep thought and although very bleak paints a huge picture. To lighten things up a little with some heft and imagination is gritty “Still home”. Adrian Jones guitar adds just the right amount of bite and darkness to Brendan Eyre’s crisp keyboard textures. A short reprise of this song later in the album featuring Tony Patterson (John Hackett band/re-Genesis) and the eerie backing vocals really makes this a ghost-like tale. “Falling Stars” lures the listening into thinking it is going to be a lilting ballad with soft and almost pleading vocals accompanied by piano until fifty seconds in it turns a bit more sinister. For those of you with large speakers I would suggest you proceed with caution. There are some very deep frequencies on this track, so much so it may actually fragment kidney stones. Adrian Jones’s nightmare guitar and a mean synth solo make this a compelling listen. Allowing the dust to settle for a while the fore mentioned ballad happens along in the rather beautiful “Wiser”. Ashley Mulford (Sad Café/Mandala Band) adds impetus to this lilting and sad song. I have to admit that this has become a personal favourite of mine. Ashley’s passionate blues licks are simply stunning and Brendan Eyre’s organ playing reminded me of Camel. “Freeze The Frame” is another almost sleepy tune and yet again seems to be haunting and atmospheric invoking many images. The Richard Wright style synth solo is a treat on the ears and it reminded me of happier times. To conclude the album is of course the all-important title track and it is no disappointment. The now tried and tested formula of tranquil beginnings to the songs and finishing grand utilises fully every weapon available in Riversea’s arsenal. Mark Rowen yet again blinding the listener with another great guitar contribution this time joined by Mostly Autumn’s Liam Davison. It really does have the tingle factor and as a debut it may prove to be a tough act to follow. Though credit must be given to its many contributors it is the quality of the writing and composition that puts “Out Of An Ancient World” head and shoulders above some of the present wave of self-purporting progressive artistes. There is something for most people on this album, whether you are a traditional prog lover like myself or just enjoy quality rock. Buy with confidence. Don’t leave it too late though because I have a feeling this album will sell out pretty quick once it gets some air play. 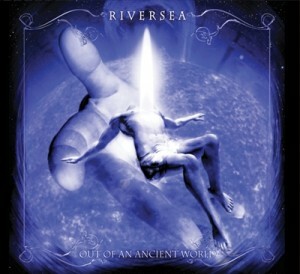 The album is available to pre-order from www.riversea-band.com and costs £10. Release is scheduled for between May 15th and June 1st.